YOSHI-HASHI and Adam Page got in each other's faces after the match. SUZUKI-GUN (Minoru Suzuki & El Desperado) vs. BULLET CLUB FIRING SQUAD (Tanga Loa & Bad Luck Fale)- DUD! Same old sh*t, as was the brawl between Suzuki and Fale afterwards. Hopefully their G1 match is over with quickly. LIJ won. After the match, EVIL attacked Yoh with a chair for no reason. He dared Jay White to come and save him but Jay didn't. Definitely a heel move on Jay's part... but do you know who else was right there at ringside and didn't lift a finger to save Yoh? His own mentor Rocky Romero. I don't want to alarm anyone, but Tanahashi and Okada are pretty good together. These two had a really GREAT match, but the fact that doesn't matter in the tournament and I know Ishii isn't getting a US Title shot makes it hard for me to actually care. I enjoyed seeing big tough Ishii beat on smaller but still tough Juice and Juice fight through it, but Gedo's booking tells me not to care, and thus it's hard for me to care. Zack wins. At least in this case I assume the champion losing actually will result in a title match. No Tanga Loa at ringside for Tama for some reason. Tama Tonga hid in the crowd and jumped Ibushi during his entrance. So let me get this straight: Tama Tonga has wrestled this entire tournament not really caring about winning or losing and having his friends interfere in this matches at will, and now that he is mathematically eliminated from the tournament and has a match against his arch-enemy's tag team partner, best friend, and possible lover all rolled up into one... he doesn't just go all out with the interference and weapons and so forth? They did some stuff for a while, then brawled into the crowd so that Kota could do a moonsault off of a balcony. The referee, of course, made no effort to count them out. IT'S A F*CKING TAMA TONGA MATCH! DO A REF BUMP! His other matches have been full of them! But now that they have a match where people will expect there to be ref bumps anyway so they can easily create a logical excuse for why these guys won't be counted out while Kota does his big spot money spot (which is exactly what this is: a big dive at a totally random point in the middle of a match), and they don't do a ref bump? They got back to the ring, and as Kota was looking like he had the win, Tanga Loa ran down and attacked Kota right in front of the referee, but there was no DQ for this. It happened again, with once again there not being a DQ. This all despite the fact that the biggest story this tournament (other than "who is going to win?" of course) has been the referees becoming strict on the DQs in the Firing Squad's matches. We finally got our ref bump and Fale ran out as well, but Omega ran out to help Ibushi, and got laid out for it. More stuff happened, and Tama Tonga eventually pinned Kota for the win, which means that either Kenny is losing to Yano (which pretty clearly isn't happening) or Kenny just wins the block. WHAT? POST-MATCH SEGMENT - Good. The Firing Squad beat Kenny down, including Fale hitting him with a Bad Luck Fall. He then went to do the same to Ibushi but Page and Owens showed up with chairs in hand to chase them off. This at least creates a situation where the idea of Kenny losing to Yano is more believable, but I still don't buy for a moment that they would choose to have YANO get a win over the IWGP Heavyweight Champion instead of having someone else pin Kenny at an early point in the tournament or just having Tama Tonga lose again. Yano comes down for the match, but Kenny isn't ready yet. Yano goes for a pin but Kenny just manages to kick out. "PURE INSTINCT!" Kevin Kelly exclaims. Yano, having the IWGP Heavyweight Champion down and the best chance he'll EVER have at earning a shot at the prestigious IWGP Heavyweight Title... immediately goes around and starts taking the turnbuckle pads off of as many turnbuckles as he can rather than following up. Bullet Club is doing their best to combat Yano's technically illegal maneuverings, and that was entertaining, but you can tell from Kenny's movements that he's in clown mode, and that is something the IWGP Heavyweight Champion should never be. Yano gathered all of the turnbuckle pads to the middle of the ring and went to slam Kenny down onto them. That would make it hurt LESS. Sure enough, when Yano gave Kenny a vertical suplex onto them, Kenny didn't sell it at all. That makes sense... but this whole thing makes Yano look like an idiot. More stuff happened, including them hitting each other with the pads. They wound up on the outside and Yano tried to tape Kenny's arm to the guardrail but Narita ran over to stop him. Look... either Yano is doing something illegal and the referee should disqualify him, or he's not doing something illegal, in which case Narita shouldn't be getting in his way and the referee should DQ Omega because Narita is interfering on his behalf. Yano taped Omega and Narita's arms together and then threw Narita over the barricade to make things more difficult for Kenny. That was clever. Then Kevin Kelly had to ruin it by insisting that if Kenny returned to the ring with Narita still attached to his arm he would "risk disqualification by bringing Narita into the ring." WHAT? I think it'd be pretty f*cking obvious to anyone- even an NJPW referee- that Kenny does not want Narita tied to his arm and that this was something Yano did to them, so why the hell would the referee DQ Kenny over this? If anyone, he'd DQ Yano. Or he would at least stop the match so that Narita could be cut free. To make matters worse, that spot they did earlier where Chase Owens used himself to shield Omega from going into the exposed turnbuckle involved Chase being in the ring in clear view of the referee, and doing so for the specific purpose of benefitting Kenny Omega, and there was no DQ for that, so why would there be one here? Kenny and Narita made it back into the ring... and the referee had no problem with this, making Kevin Kelly look like an idiot. Yano started to attack Narita for no real reason, all so it would be more justified when Narita and Kenny gave him a double clothesline. There was no DQ for Narita's involvement in this because the referee apparently just fell down in the corner. We then got more Yano cheating, including another ref bump, which led to more f*cking interference by the Firing Squad. While the other two dealt with Page and Chase, Tama Tonga ran down and attacked Yano, then hit Kenny with a Gun Stun and pulled Yano on top of him. If he was going to help Yano then why did he attack him? Did he think TORU YANO, the single dirtiest cheater in the history of New Japan, would be above accepting outside help? It's not even like they have any beef because Yano is the only person Tama Tonga hasn't faced yet. He'd probably just do his stupid shrug that makes me want to kick him in the nuts so hard that it ensures that he won't be able to pass the genetic defect that makes his obnoxious face possible down to any descendants. The beginning of this was entertaining and there was about a minute of good stuff somewhere in the middle, but the rest of this was stupid and/or frustrating. In this week's Observer, Meltzer said that the idea here is supposed to be that the Firing Squad have ruined the G1 for Kenny, but that holds no water whatsoever for two major reasons. First of all, if their goal was to ruin things for Kenny, then shouldn't they have been running in and try to screw him during all of his matches? And secondly, even this tonight doesn't ruin things for Kenny because his destiny is still in his own hands. If Kenny Omega does not advance to the finals of this year's G1, the only reason for it will be that he was unable to defeat Kota Ibushi. The only ways Kenny doesn't win are if he loses to Ibushi or if he draws with him and Naito beats ZSJ (assuming Naito wins tonight, which I'm certain he will, just because that sets up almost the exact same situation in Block B as we have in Block A, except instead of winning on tiebreakers like White would, Naito would straight up win on points). These two had one hell of a match. It was really just all of their usual stuff with nothing particularly special about it other than the drama, as Naito was fighting for his tournament life. They did do my big pet peeve spot where a guy lets up on a perfectly good submission hold (especially if it's a sleeper variation, like it was here) to try to hit a different move and that move gets reversed, but they made up for it with one of the closest nearfalls I've ever seen. 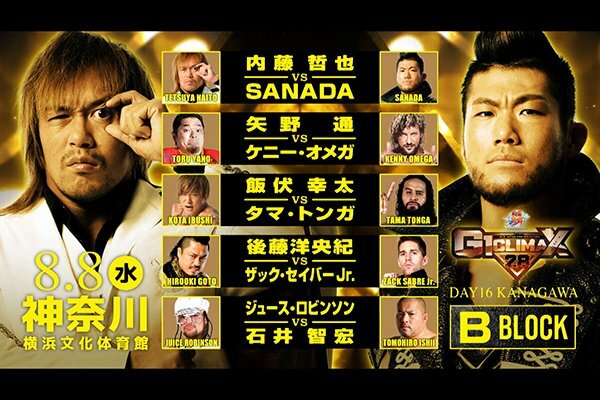 Naito picked up the win here, which means that if he wins his next match and Ibushi vs. Omega goes to a draw, he will eke out the win and represent Block B in the G1 finals. POST-MATCH SEGMENT - Good. EVIL and BUSHI came out and everyone was happy and friendly together. EVIL had one of Hiromu Takahashi's ring jackets and they said they hoped he would come back as soon as possible. Another G1 show hurt by frustrating booking. The main event and the post-match stuff are worth going out of your way to see though.